We are trying to use DDD approach, but I have some uncertainty in the field of architecture, I would be graceful I you could resolve my doubts :) . 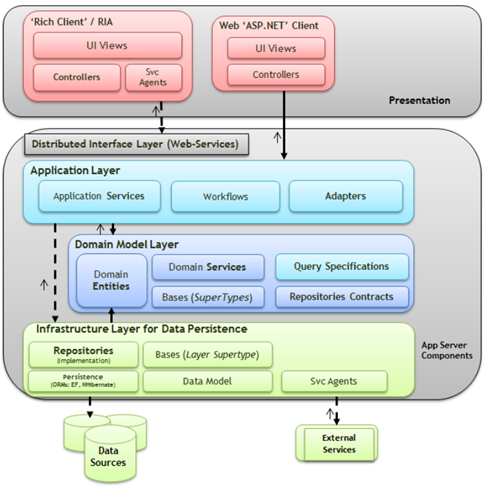 Could you explain more the DDD Architecture diagram in context of dependencies (what layers depends on what layers), please ? 1. The Presentation layer, USES (is dependent on): Distributed Interface Layer (when we have one) or Application Layer. a) Domain Layer (but Domain Layer doesn't know nothing about the application layer). Do I understand it correctly ? Where would you put DataTransferObjects (DTOs) ? Application Layer ? Infrastructure Layer ? Both ? I can imagine situation when I want DTO to be available in Infrastructure Layer, because I want to pass some complicated view (perspective that is not domain object) directly to the Presentation layer (when App Layer Asks directly repository implementation) ? Is it violation of this architecture ? I don't want to expose my Domain Model directly to the Presentation (for a number of reasons), so create DTOs in Application Layer, and transform Domain Objects to Dto in Application layer. 3. This is a great question. I think there are several questions here. Let's start with the infrastructure layer. You "Domain Model Layer" should not be even aware of the "Infrastructure Layer". You achieve this by putting interfaces (or you can call them contracts, as per diagram) for data persistence (repositories) and any other infrastructure interfaces in to the "Domain Model Layer". The actual implementation of the repositories sits in the infrastructure layer. Your infrastructure layer will need to reference "Domain Model Layer" so that Infrastructure knows what entities / objects it's dealing with. http://domainlanguage.com/ddd/patterns/DDD-Pattern-Language-Overview-sml.png (express state & computation with value objects). Data Transfer Objects i.e. DTOs are fantastic because they don't contain any logic or methods they just carry data. Also if you use an ORM like nHibernate you will notice that it uses reflection to add extra behavior to the object. Last thing you want to do is send an entity with state tracking and methods with logic to the presentation layer. This is why they are so awesome (you have mentioned this above as well). So, if you want clean separation I would query the data persistence, get back the entity or value object and map it on to a DTO via AutoMapper. Personally I would always do this even for a simple view query, this will keep everything consistent. Great post! !, It helped me a lot to understand more about DDD! Could you explain why Development becomes domain oriented not UI/Database oriented ? why not Database orianted? Domain-driven design makes your development more domain oriented and technology agnostic due to abstraction. Take a look at the onion architecture http://jeffreypalermo.com/blog/the-onion-architecture-part-1/. Some “classic” applications are very database oriented. For example some of these apps are all about stored procedures. To make things simpler, people just project stored procedure data output directly onto the UI. Overtime this creates maintenance nightmare as these stored procedures often get used by other stored procedures and they start to contain more and more business logic as business processes mature. Your user interface gets intertwined with database, database gets intertwined with business logic. Things become extremely hard to change and understand. No one understands where business process begins and ends. N-tier architecture removes this confusing business logic and UI intertwining. Domain-driven design dramatically improves maintainability through very good use of object-oriented programming and abstraction from infrastructure concerns. I hope this answer your question, once again thank you for reading. I want to say thanks for the whole articles you wrote,it's hard to find some explanation or elaboration for such topic of concept in Taiwan. I spent a lot of time learning DDD and onion architecture,and through these articles give me better understanding of that,just wanna to say thanks. I had some question in my mind. I hope you would be able to help me. Which is more preferable?. I know DDD depends on the domain, but this use case is fairly popular. Hence my question. It depends on the object that you are interacting with and the context that you are in. However, in a generic scenario I would prefer Cart.Add(Product). This is because when you are in the shop you pick up a cart and you add products in to the cart. You don’t pick up a product and put cart in to it. Have one question, regarding persistence using nhibernate. In the sample code, there were Customer and CreditCard. basically 1-to-M and M-to-1 nhibernate mapping respectively when using anemic models. Based on my understanding of ddd, when creating a Customer, it should be loaded with all the info it needs, like the details and, based on the example, the "CreditCards" property. If that property is exposed as ReadCollection and get only, how it is going to be populated? - but the Repository now need to know this detail, must ensure that it populated the credits property before returning an instance of a Customer. Great post. I have a question though - why would you use Create factory methods to create new instances instead of plain old constructors? 1. If constructor is used to create a cart, and constructor raises domain events then what should domain event be called? CartCreating or CartCreated? Technically Cart is not created until constructor has finished constructing the cart. 2. Constructors should be light and should just create the objects, even though domain event is a decoupled pub/sub pattern it's still synchronous and I really don't like the idea of my constructor executing some handles that are sending emails, auditing, etc. Another reason as to why static methods for Object creation is, Input Validation. If the requirement states that a customer object cannot be created with an invalid email. InvalidArgumentException is the only option with constructor approach. With static method approach, the failure reason can be sent back to the caller with some specialized return type that can hold success/failure flag, actual object and a proper error message in-case of a failure. Using exceptions to handle the control flow is bad and expensive too. Another reason could be, how the failed validation rules are sent to the caller. With constructor approach only option is to throw InvalidArgumentException. But, with static method you can communicate the object construction failure (because of valid validation rules, like invalid email for customer object creation from above code) using a specialized return type that can hold the actual object plus the failure reason in-case of a failure. This could be a better approach as using exceptions to alter the control flow is bad and expensive. I have a question about moving from an anemic model to a domain driven design. In the anemic model, we were using data annotations which EF would use to map to tables in the database. With DDD, the models are not just data bags but contain the domain logic as well and are decoupled from persistence. How does the infrastructure use this model with an ORM (EF is of interest to me)? How is the mapping to the database done? If the validation occurs in the domain, is there a duplicate logic going on in the infrastructure to setup (required, datalength, key, foreign key, and so forth) the DBContext? I would appreciate some insight here since I get the need to separate the model from persistence, but I don't see how you do this without repeating the model properties when setting up the database mappings. Thank you very much for your article. It's very awesome. I would like to have a question about aggregate roots, the nested ones. PRODUCT and CATEGORY are considered as aggregate roots, How can we organize models and repositories for them ?